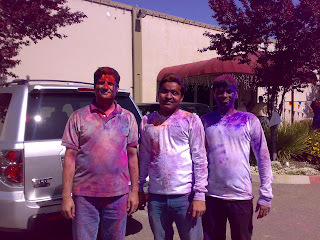 You know what, I got to play holi in US. It was really a fun. I got to know from one of my friend on 21st that Holi celebration will be held at Hindu Sunnyvale temple and I was like so happy. Here is a snap after playing holi. There were so many Indians around who had also come to play holi. There were many americans and chinese also. It was really fun to dance on Rang Barse sung by Amitabh Bacchan in movie Silsiley. There was also lunch program after playing holi but as my hands were not good I choose to go home and then eat something instead of having lunch there. It took about an hour for me to get well after playing with colors but it was worth after having so much of the fun dancing with colors. Kiran Thakkar, CISSP An expert into IDAM space working on Oracle stack of IDM products for last more than 6 years.